In order to combat climate change and cut CO2 emissions, the French government has instigated an ambitious renovation programme aimed at the thermal insulation of the existing housing stock. This will have a considerable effect on the renovation of period timber-frame houses, a fragile architectural heritage that in certain regions of France forms a considerable part of historic villages and town centres. This study focuses on vernacular timber-frame buildings with brick or daub infill in SW France, and assesses the environmental impact of thermal renovation of exterior timber-frame walls. For the building assessment the French Excel-based tool, Cocon (2009) is used, which is linked to two French databases for life cycle analysis of building materials, Inies (2009) and Grecau (2009). Besides the environmental impact assessment, which is reflected by the scores for embodied energy, embodied carbon and resource depletion, Cocon also assesses the thermal performance by including parameters for thermal resistance, decrement delay and thermal inertia. For each of the 20 wall types in this study Cocon calculates an overall score based on these six parameters. The selection of wall types and insulation techniques discussed here is based on the outcome of interviews with builders, architects and building experts. and bricks (or rendered daub) exposed is an absolute priority. Several wall types with insulation by ‘plant fibre and binder’ (e.g. earth& straw) also show good results. These natural materials are very compatible with the vernacular timber-frame walls and are an appropriate solution when exterior insulation is not desired for aesthetic reasons. Several socalled ecological solutions that do not perform well in the assessment are hempcrete, cellulose and insulation clay blocks. An important conclusion from the study is that most builders are not specialised in restoration of historic buildings and therefore lack the necessary skills and knowledge about appropriate insulation materials and techniques. Furthermore there is lack of technical information on ecological building materials, reflected by a lack of official recognition. However, there is growing scientific evidence that natural and breathable materials are better for the environment, the building and the occupant. 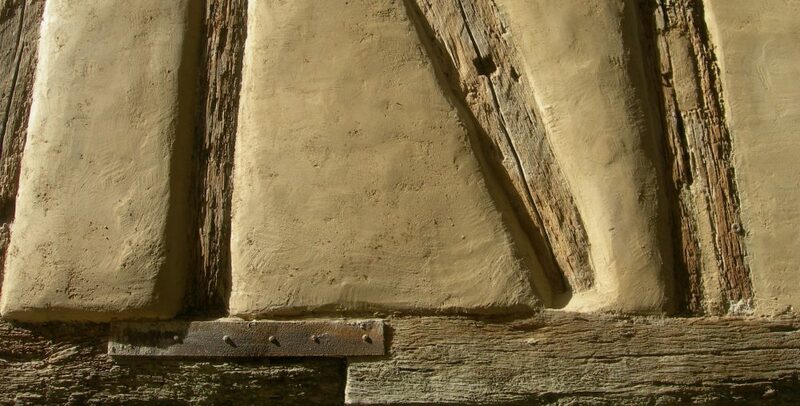 Further case studies and surveys are needed to demonstrate that current insulation techniques are not appropriate for the restoration of historic timber-frame buildings and can put these at risk.